As mentioned earlier Gary Wilkes is a thoughtful writer on dogs and is willing to make definitive statements. Since some of these statements touch on my theory, I like to expound on these topics since I can contrast my model with a gene-centric interpretation as offered by Wilkes. We will find that gene-centric theories are recursive and always end up in self-contradicting logic loops. KB: In other words if a gene-centric theory can’t explain something, then there is no need for an explanation. Note that geologists don’t have a “way-back machine” and yet they are able to formulate informed explanations on past events based on what they can indeed know of geological processes they study in the present. Now the behavioral processes in the present, and can which help us make informed explanations on why dogs do what they do, are emotional processes. But unfortunately the gene-centric theorists are formulating explanations based solely on natural selection of genes, instincts and human conceptualizations of nature. They will even insert human thoughts into the mind of a dog (or any animal) in order to make the explanation seem complete. At least Wilkes is bold enough to indicate where he has reach an explanatory limit. But his premise that the explanatory possibilities have been exhausted is incorrect. KB The most important component of animal behavior is emotion and yet behavioral sciences and those who think in depth about dogs have been busy constructing theories and explanations while admitting they don’t understand emotion, the most important fundamental of the animal mind and behavior. Emotion is the confluence of physiology and neurology in service to locomotion. It is not fundamentally about survival of the individual or the species, but of establishing a networked consciousness through collectivized movements. This not only ensures survival but enables a trans-species communication that adds new energy to the system. Dogs are the exemplars of this emotional phenomenon which is how they flourish in tandem with humans. Emotion as energy runs to ground just as all energies in nature run to ground. A “preyful aspect” which is anything to do with a body and even fresh snow, dew or the bio-musk of disturbed earth, is an emotional ground. 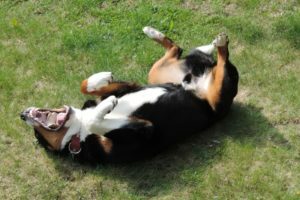 When a dog experiences resistance to movement, this registers as tension in the tips of his shoulder blades and so ALL dogs roll on their backs to ground out this tension, and some seek out more vivid grounds (poop, blood, carrion, etc.) to release their muscular tension being held in the forequarters. The most important thing is to understand that the network is more elemental than genes. There is no gene or set of genes that encode for the V formation that geese fly in. Given their body plan it’s the only way they can cover great distances. Their locomotive rhythm causes them to network. Want to Learn More about Natural Dog Training? 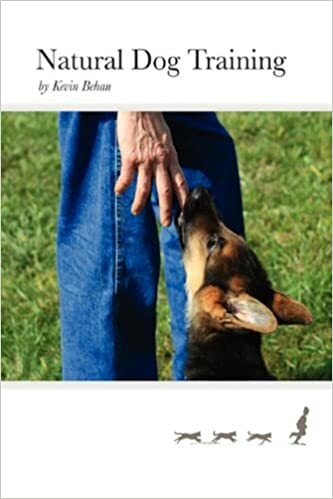 Join the exclusive and interactive group that will allow you to ask questions and take part in discussions with the founder of the Natural Dog Training method, Kevin Behan. Join over 65 Natural Dog trainers and owners, discussing hundreds of dog training topics with photos and videos! We will cover such topics as natural puppy rearing, and how to properly develop your dog's drive and use it to create an emotional bond and achieve obedience as a result. 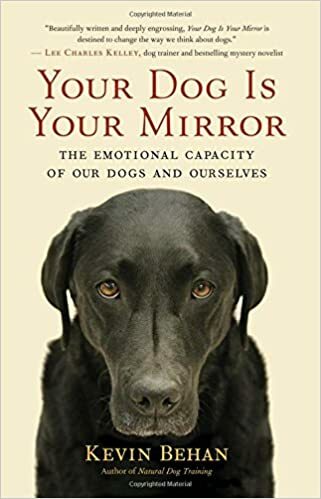 I recently read Your Dog is Your Mirror and really enjoy and resonate with most of what you say. Thank you for posting you expansive knowledge. I had a couple of incidents with my dogs this week which I’m trying to unpick in terms of emotion, grounding and collapsing – mine and the dogs which I think is related to what you are talking about. The first incident involved a dog off lead coming up to one of my dogs Jack onlead. He ran over to us. Jack was excited alert, interested. Then the mood changed and this much bigger, and younger dog turned aggressive and jumped on Jack. My reading of the situation is that the bigger dog was attracted initially but then when faced with jack’s excitement, his behaviour ‘collapsed’ and aggression was his only option? Jack didn’t retaliate he squeaked and collapsed under the bigger dog. The bigger dog had to be pulled off. The second incident involved my lab, Archie and an older black dog Corrie. Corrie has an interesting behaviour. When he sees another dog coming he just watches and sits. Archie’s behaviour…this has happened before…was to make a bee-line for corrie and hump him. The dog carries on sitting. In this case the male owner grabbed Archie and pulled him off. When he let him go Archie went back. So Archie is attracted, but is becoming more sensuous rather than collapsing. Or is he just collapsing into a different type of behaviour because of his breed and personality? Obviously both behaviours are inappropriate. But seems to me that both are examples of a dog trying to get energy to run to ground? Can you help me distinguish what is going on in each case? It might help me work out the human angle, because both incidents had a charge for me, particularly the one where my dog, Archie, was acting inappropriately! I would say that Jack is harboring stuck energy and when he felt safe enough and this energy began to move, the surge destabilized this brittle natured dog and he exploded. Not coincidentally Archie manifested the exact equal/opposite orientation, sensual arousal when deep latent energy moves hence the hubba hubba. So both dogs holding back –equal– but different responses — opposites. Now you can join a subscription-based study group specifically for the Natural Dog Training method, which provides a direct line to its founder to ask your questions about its core exercises, raising a puppy right, rehabilitating an aggressive dog, and more.